Today, Im delighted to welcome Krissy from KZ and Me, which is a gorgeous blog focusing on baby play, Krissy is sharing this fun filled Demolition Derby for our Brilliant Baby Play Series. 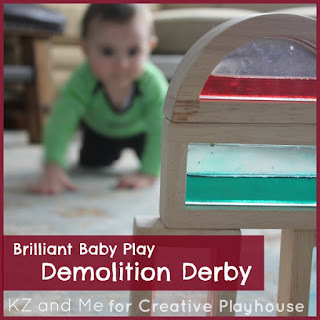 We are so excited to be guest posting here at Creative Playhouse! This is one of our favorite go-to spots for amazing ideas about learning, play, creativity and fun. Thanks for having us! If your pre-toddler is newly on the go, like Kz, then chances are all those sit-down activities you've been doing are losing their flare. This simple game will keep your child entertained while expending some of that (seemingly endless) supply of energy! Kz thinks knocking down block towers is hilarious. He gives one of those deep belly laughs every time. While adults might consider this behavior to be destructive, it's developmentally appropriate for tots to be fascinated with the physics of unstable structures. The sound and sight of a toppling tower provide a startling sensory experience that keeps kids coming back time and time again. With this in mind, I started building small towers all around the room. I made sure to put some distance between them, allowing Kz to practice those new crawling skills and build gross motor coordination. "You want me to knock these down? No problem!!!" My hubby was around for this activity so it got a little competitive. We started using different materials and toys to build our towers, working quickly to find balance before Kz came barrelling toward them. 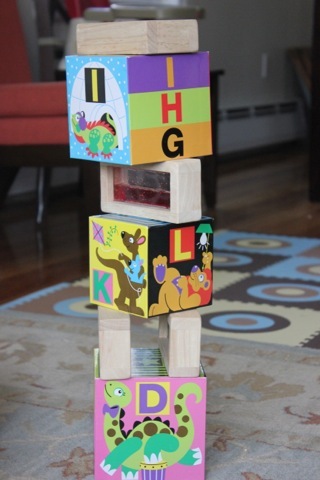 Varying the material, size and shape of the towers helps keep everyone interested and provides big incentive for your child to crawl over and check them out. 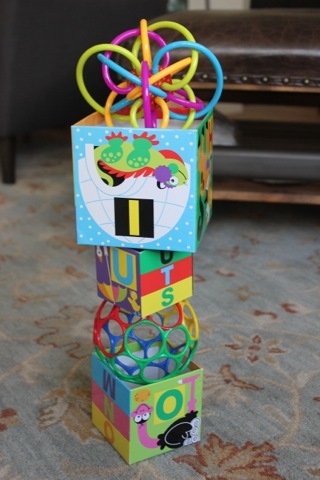 This activity is definitely easier with two people but if you're feeling playful, it can be a blast trying to build the towers all around the room before your little one strikes. Either way, when the game is done, everyone playing is ready for a nap! Krissy is a former preschool teacher and a newbie stay at home mom. She has been having a blast playing with her 10 month old son and loves documenting their fun together at Kz and Me. Don't miss a playful moment...Follow us on Facebook and Pinterest! LOVE this...Krissy you are a wonderful blogger and Kz is just adorable...keep the ideas coming! 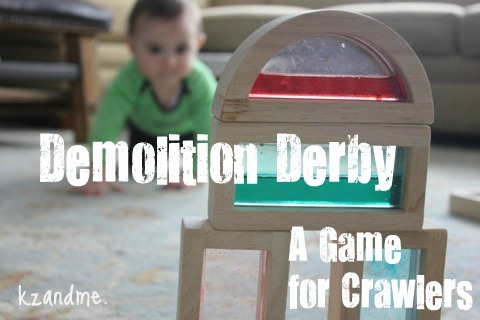 This would be a great duo game for my toddler and baby. The toddler could build and the baby destroy. Fun!